A few months back, our team got together to discuss areas for improvement that we see in the organization and how we can address them. One of the main topics, brought up during the first of many meetings, was the discrepancy in the level of inclusion and engagement with our partner cooperatives. The truth is that Café Artesanal San Miguel, which is the most developed of all five groups, enjoys more opportunities than the rest. It is the first co-op we started working with, and having grown together over the years, we have gotten to know each other well and have built mutual trust. The fact that we personally know and regularly see all members is certainly not without significance. When there is something interesting going on, they are the first to know. But even putting aside personal connections, their proximity to Antigua gives Café Artesanal opportunities that other cooperatives don’t have. The farmers not only benefit from the favorable combination of climate and altitude, and world recognition of Antigua coffee, but also, it is thanks to Antigua’s status as a travel destination that De la Gente has been able to develop a successful community tourism program. Last but not least, the Antigua-area economy is stronger than the rest of the country, with more and better-paid jobs. Growing a well-established business is surely easier than starting things from scratch, but it doesn’t mean we should only aim for low-hanging fruit. That’s why we brought on board more cooperatives 3 years ago. Reflecting on whether we were happy with the degree of collaboration we have achieved since then, we realized there’s still more work to do. As a result, even though the initial plan was to scout out more partner co-ops this year, we came to the conclusion that there is still a lot to do to improve partnership with the groups we already work with; building up more trust and deepening mutual understanding became our main focus this off-harvest season. The goal was ambitious and the obstacles were plenty. How to earn trust and establish cross-cultural friendships without being able to spend very much time together? How to get to know farmers individually and on a personal level when De la Gente struggles with high staff turnover? How to convince farmers that they can approach us -- their only recurring buyer who pays significantly more than their second-best option -- even with sensitive topics without being afraid of repercussions or risking a “difficult partner” label? How to share financial details in an understandable and comprehensive manner to make sure producers understand our business model, no matter what their level of financial literacy? On top of that, a sizable proportion of the Guatemalan population doesn’t feel comfortable speaking Spanish, which isn’t the mother tongue to many of us either. Moreover, some co-ops are so spread out that even bringing a majority of members together is a challenge. Despite of all these obstacles, we were committed to build these relationships and decided the best way to do so would be by more frequent and longer visits in all communities. In order to attract more farmers, we chose to build the agenda around a formal presentation on our business model and finances. However, we made sure to include time for socializing in order to foster one-on-one interaction between farmers and De la Gente staff. And so, to get started, we hit the road to visit Ija’tz and UPC. A regular supply chain vs. De la Gente’s. The richly-illustrated presentation began with a comparison between a regular supply chain and De la Gente’s. Then we showed how the whole process of logistics plays out in reality: maps with their coffee’s trajectory, images of the port, videos of container ships unloading and rail transport, photos of actual roasters and their coffee bags. Next, we presented all buyers of the specific cooperative’s coffee, showing photos of their roasting facilities, cafés, and packaging. Many farmers had the chance to meet a green coffee buyer or two on an origin trip (familiar faces were recognized in the photos! ), but seeing exactly how and where their coffee is roasted, sold and consumed was definitely interesting for them. Before the break we organized a quick quiz, asking questions about what farmers had just learnt and giving small prizes for the correct answers. Then participants helped us prepare coffee for the coffee break, using brewing methods completely new to them like Chemex or Aaeropress. The activity, as expected, turned out to be a great ice-breaker. Divided into smaller groups, farmers felt comfortable to ask us non-coffee-related questions, and there was a lot of laughter involved. Refreshed by a cup of home-brewed coffee, we continued with the most challenging part of the presentation - the finances. Since there are usually just a few co-op members who deal with contracts, misunderstandings about payments, as well as dry-milling, bagging, and transportation costs are not uncommon. That’s why we explained what FOB price is vs. the amount of money a farmer actually receives, specifying all the co-op’s costs. Participants could also see our contracts with buyers, sale prices, and the breakdown of all our costs - from importing to warehousing. The data was presented on a per-pound basis as to not overwhelm farmers with large numbers, but an annual summary was also included. When we decided to organize these visits, we knew it would be the moment to reverse the direction of our usual communication - instead of telling you about the farmers, we wanted to tell them more about you. 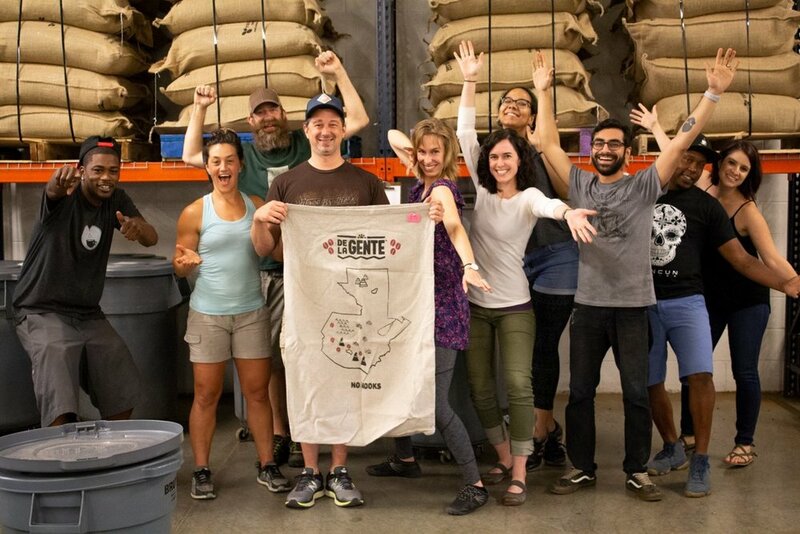 That’s why we reached out to both green coffee buyers and individual customers asking if they’d like to send a message to their coffee producers. Their responses, which constituted the last part of the presentation, exceeded our expectations. Among others, Ija’tz members were taken on a virtual tour of St. Marys, Ontario, home to Snapping Turtle Coffee Roasters and read a moving, personal letter from Gregg, a farmer from Colorado who lived at Lake Atitlán for a couple of years. Similarly, the farmers of UPC really enjoyed an awesome video made for them by Nossa Familia Coffee. It was very special for the producers to receive these expressions of gratitude from you, so I would like to once again say a big “thank you” to all of those who supported us with this little project. The Joe van Gogh team sending their thanks! Apart from the presentation and the brewing workshop, we also used these trips as an opportunity to meet with the cooperative’s board of directors. We gave a summary of the last crop’s sales and discussed plans for the upcoming harvest. The most important piece of information was our plan to change export partner; we explained what it meant for the farmers in terms of timeline, costs, required documents, and logistics. Some other topics included the importance of preparing representative samples and best practices that should be followed in this regard. Additionally, we talked about the further inclusion of other co-ops in De la Gente’s community tourism program and had the farmers weigh in on their most pressing needs in order to plan our next cooperative assistance projects. Apart from formal meetings with the assembly and board members, our goal at both Ija’tz and UPC was to meet new farmers and to visit their fields. Trips to the fields present great, informal opportunities to build relationships, as the farmers are really eager and proud to show their plants, and feel more comfortable receiving a visit out of their house or cooperative’s office. A hike together creates a space to chat and get to know each other. Hiking to the coffee fields. Already upon arrival at Ija’tz we saw some new faces. Our satisfaction became even greater when we learnt that one of them, German, was part of the cooperative’s old guard. Discouraged by some of the group’s internal issues German left Ija’tz for a couple of years, but now, seeing the cooperative bouncing back, decided to re-join. German’s coffee fields are different from anything we had ever seen. They look like a well-designed garden, full of fruit, herbs and chili peppers. When coffee prices fall, crop diversification helps him survive. We also had a chance to see the co-op’s plant nursery, full of corona varietal seedlings. Carlos, the second producer who kindly invited us to see his land, is an older, quiet man. His field lies almost on the shore of the lake, which makes its value grow quickly, as more and more people are interested in buying lots to build houses in this beautiful area. But Carlos doesn’t plan to sell his field, even though none of his children are interested in coffee farming. He hopes that one of his grandchildren may one day follow in his steps. We really hope so, too. Unexpectedly, during our stay we also got closer to a few women at Ija’tz, who prepared delicious meals for us. They finally agreed to join us for dinner -- an event without precedent! When it was finally time to say “goodbye,” an elderly lady, who had joined us just for the presentation, approached us to say she really wanted to give us a hug! We left San Lucas Tolimán in high spirits. At UPC not all went so smoothly. We found the town of La Democracia in the midst of a blackout! A tiny detail that hadn’t even crossed our minds. All the effort we put in preparing such a visual presentation was about to be in vain, and there was little hope for brewing any coffee at all, no matter the method… Luckily, UPC’s spare power generator roared to life and came to our rescue. Phew! Field visits were also not easy in Huehuetenango, but they were definitely fun! We headed off to meet the producers of microlots that we purchased from UPC this year and whom we hadn’t yet had a chance to meet in person. It turned out, however, that finding a particular coffee farmer in this area can become a great challenge, even for the locals. Those of you who follow us on social media read the story of our adventurous, yet successful, search for Anacleto, the pacamara producer. Anacleto came off as a kind and good-humored man. He lived in the U.S. for 12 years, working in construction and agriculture in a number of different states, but returned to Guatemala because of his wife's health problems. Anacleto now has 8 cuerdas of pacamara, which we were fortunate to see, and another 50 cuerdas of other coffee plants. Hiking up to the fields! On the way back, we dropped by the home of Dorotea, one of two female farmers who produced and processed De la Gente’s women’s microlot this year. Dorotea, now 62, comes from an extremely poor Mam family and started working in coffee after getting married at the age of 14. Her husband, Miguel, bought his first 10 cuerdas from the finca where he worked after an accident left his eyesight damaged. Since then the couple have grown their business aggressively, and they now own 120 cuerdas of land, part of which is certified organic. Considering the volume of coffee the family processes every year, their at-home wet processing facilities probably shouldn’t surprise us, but its scale really impressed us. All in all, I think we can consider these visits a success. We were really happy with the Ija’tz visit where everything went even better than expected. Well, maybe we could work on the farmers’ punctuality a bit. Knowing that punctuality is not their virtue, we invited everybody for an hour earlier than we were actually planning to begin the presentation. It helped, but we needed to wait another half an hour more before everybody was ready to go. However, it was worth it, as the attendance rate was higher than ever. At UPC, many farmers also came to the meeting, but their time was limited. Since most participants rely on sparse public transportation and had to travel great lengths to attend the event, they had to leave immediately after our already shortened presentation. Even if we didn’t socialized as much as we would have liked to, we appreciate the time and effort the farmers took to come see us. These visits were definitely a good start. The next steps will be arranging similar trips to the other two cooperatives, la Suiza and Santa Anita, and to maintain a more permanent communication with all four groups to ensure that we keep building trust. We have also committed to create a greater equality of opportunities for all of our partner co-ops. Having already taken steps to get us closer to our objective, I believe we are heading in the right direction.